So far, this year has been all about decorating our new home. If you've seen my home renovations vlogs (here and here), you'll know how much work we had to do at the start but now that the big stuff is all done, we can start to focus on the fun things like bedding and cushions. Obviously, the bed is the main focus of the bedroom and it's not just the cushions, the bedspread totally sets the theme for the room. Over the next month or so, we're hoping to finish off our bedroom and I'm so excited to finally tick off the first room as complete! Our house has a minimal theme throughout and the walls are all either white or grey, but each room will still have it's only little mini colour scheme. I love the idea of adding colour through our bedding or accessories. 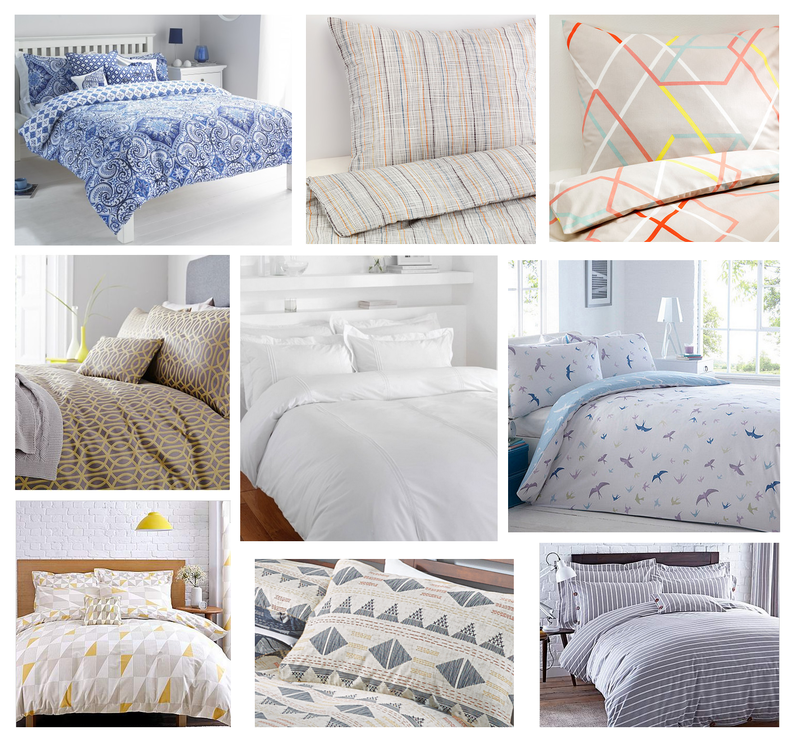 Having such a neutral colour palette means we can easily change up the whole look by adding a colourful bed spread. I love grey, white and yellow together and this geometric print bedspread from Dunelm is one of my favourites. Ikea are also really good for those minimal bedspreads with just a bit of colour. I also love this blue print kingsize bedspread from Yorkshire Linen - I love how it adds all the detail you'd need in a white bedroom and it has a definite Scandinavian vibe to it. If you want to go completely minimal, you can't go wrong with an all-white bed spread too. At the moment I have a minimalist white bedpsread like the one above, but with lots of cushions in faux fur and velour in neutral colours and I love how the texture adds it's own bit of detail. I'll do a bedroom tour in the next month - I can't wait to show you how it all turns out! *collaborate post with Yorkshire Linen - written by me, opinions my own. 6 comments on "HOME | Minimal Bedroom Styling"
These are gorgeous, I have just moved house and I'm making an effort to be more minimalist right now we're playing with colour schemes which is so much fun and I love readins posts like these! Reading this post makes me so excited to move out for uni next year!